Clicking on the image below will take out to a live demonstration of the slideshow widget in action. You can download the source files for this tutorial to study. Along with the entire jQuery script used in this tutorial, the source file package also contains a PSD file named mockup-slideshow.psd for the web layout of the demonstration page, as well as the CSS background images and additional auxiliary files used to create the slideshow. The most important part of any good web component is a solid HTML structure. A semantic foundation means that your content will be web accessible in virtually all browser clients. Our content’s structure involves a div called #slideshow that serves as the container for our slideshow. Nested inside it is another div called #slideContainer that holds the slides, which are divs with a class set to .slide. Tip: Test web accessibility first, and often. When working on anything new, you should always test your HTML structure for accessibility. You can use a free web application called WebAnywhere for screen reader web accessibility tests to simulate how a person using a screen reader will interact with your content. For #slidesContainer, we set the overflow property to auto so that scroll bars appear when our content overflows over the set height of 263px (the height of our slides). Alternatively, you can give the .slide style rule a float:left; property so that instead of scrolling vertically, users can scroll horizontally. The elements will be <span> elements, so we declare a cursor property and assign it the value of pointer to change the mouse pointer when the user hovers over the controls. We use the text-indent property to hide the text out of sight, a CSS background image replacement method. With our HTML and CSS in place, it’s time for the fun stuff. 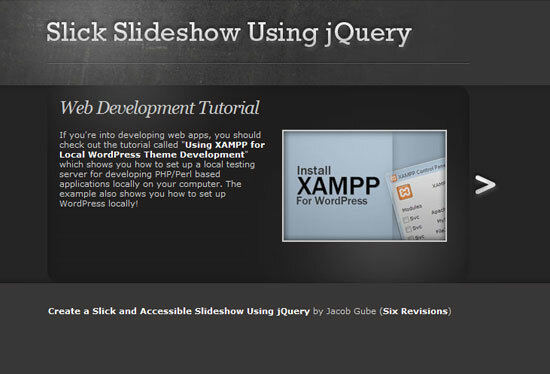 We’ll use the jQuery library to make our slideshow more interactive and animated. Then, by DOM manipulation, we insert a div called #slideInner that wraps around all of our slides that has a width equal to the total width of all the .slide div. First we initiate some variables at the top of the script that we’ll use throughout the script. currentPosition will be a number that contains the current position of the slideshow. slideWidth is the width of each .slide div, which is fixed at 560px. I chose to declare an object for the $('.slide') selector to make our code look a bit cleaner, but you can skip this and instead use the full selector ($('.slide')) in your syntax. Finally, we determine the number of slides in our slideshow using the .length method. We’ll use the margin property to move our slides left and right (more on this later). To do so, we need to create a div that wraps around all of our .slide divs, set to the same width as the total width of all our slides. By adjusting this div’s margin property (later on), we will create the effect of it moving left and right. We also need to set the width of #slideInner, the newly created div, to the total width of all .slide divs. We can chain the .css method along with the .wrapAll() method we used in Block 8. To manage our controls, we create a function called manageControls that hides and shows the left and right arrow controls based on the current position of the slideshow. If it’s on the first slide, we hide the left control because there is no preceding slide. On the last slide, we hide the right control because the user has reached the end of the slideshow. We do this by using the .hide() and .show() jQuery methods that hides/shows the selected DOM element/s that precedes it. When our first script loads, we should call the manageControls() function once to hide the left arrow control. Calling it is easy, we just pass the currentPosition argument into it which should be 0 initially. The final step to the jQuery slideshow script is binding events to the left and right controls. This essentially creates “event listeners” that triggers functions when the user clicks on either the left or right arrow controls. When the user clicks on a control, we update the value of the currentPosition variable: if the user clicks on the right arrow control (with the ID of #rightControl) then we add one to our currentPosition; if the user clicks on the left arrow control (with the ID of #lefControl), then we subtract 1 from currentPosition. What you see below is called a ternary operator, which is shorthand for if/else control structures. After we’ve adjusted the value of currentPosition, we call manageControls() again to hide or show our controls based on our new slide position. Finally, we move #slideInner to the left or right by animating it’s margin-left CSS property value. The left margin is the negative of the width of our slides multiplied by our current position. For example, if we’re moving to Slide 3, then our left margin is equal to -1120px. What did you think about this tutorial? Were you confused at any point? Was it the fastest and most efficient way possible? Did you spot errors or points of improvement? Hopefully, this tech tutorial broke things down enough to make it simple to follow! Please share your thoughts in the comments so that we can improve tutorials here on Six Revisions. Additionally, if you have questions, we’d love to help – so don’t be shy!